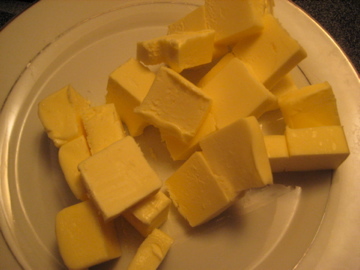 Clearly, this qualifies as a whole mess of butter. Before the holidays I would have been all over butter as a main ingredient, but I’m feeling pretty food-hungover lately. If I had been making anything other than Chocolate Cupcakes with Crispy Magic Frosting – my second attempt from the Flour cookbook – I may have passed altogether. However, I am committed to using this book to make me a better baker, so I pressed on through the ingredient list. 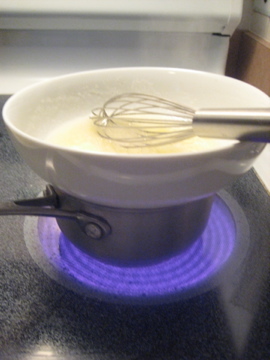 The instructions were to mix egg whites and sugar into a slurry and then heat, while whisking, over simmering water. I really, really thought I had performed this task perfectly, but the finished icing was nowhere near as sweet, nor as delightfully crispy as those from the cupcakes I buy and devour at Flour. Sigh. The cakes did turn out better than my vegan attempt – I adjusted the cooking time, though I still wish I’d taken them out a minute earlier. 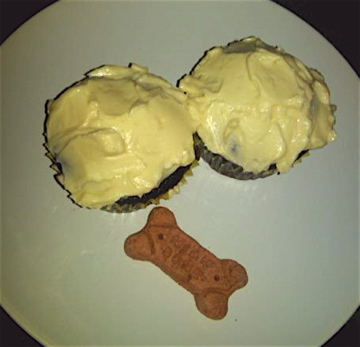 I was also mystified that the store-bought cupcakes seem to have chocolate bits in them, but these did not. I even re-read the recipe to make sure I hadn’t missed something (stranger things have happened), but nope. Puzzling. I think I would have been content with these cupcakes if I didn’t know how good they were supposed to be, though as it was I felt annoyed that they ended up being a semi-sweet imitation. But then again, some people like cupcakes that aren’t super sweet. Next up: Vanilla Cream – Filled Doughnuts.